There were certain regions in Sub-Saharan Africa where local music was barely recorded – if at all – by commercial companies or ethnographers, until at least after World War II. The result is that commercial recording of Sub-Saharan African music from ca. 1927-1946 is skewed heavily toward certain types of musical styles found in certain cities. This is, I suppose, an important thing to remember whenever one is about to make an attempt to describe what early “African music” sounds like. There are many exceptions to this generalization, of course. Often, rural populations had relocated to cities and companies were able to record musicians there. Sometimes artists were brought to cities, as was the case with the infamous London-based West African recordings on the Zonophone series from ca. 1927-1930, which really can be seen as the starting point for commercial recordings of Sub-Saharan popular music. There were also companies that were, it seems, casting about wildly for as many types of recording artists they could find, in order to develop a market. A good, early example of that are the 23 Ugandan discs issued by the German Odeon company in 1931 – the first time any company had recorded in Uganda. Of this mere 23, there were deeply traditional solo singers, one-string fiddlers, and even a Christian boys’ choir. (These remained the only Ugandan commercial recordings for probably a decade.) But, by and large, because of the recording sites and what we know exists, I don’t think it’s at all a stretch to say that what was captured pre-WWII in Sub-Saharan Africa is merely a nano-sampling of what existed. The reasons for this are varied. For the most part, record companies simply did not have transportation routes available for them to lug their equipment until industrial expansion in the years following World War II. By the time they were able to do this, however, the advent of cheaper equipment and portable magnetic tape brought a host of local competitors. Independent labels cropped up everywhere, in many major cities – a topic I’ve discussed in numerous posts. These small businesses could record on tape, ship their tapes to various pressing plants in Europe or India, and still make money selling very limited runs of discs. In some cases, for example Congo, large labels like HMV and Columbia merely repressed recordings that had already been made by local labels. It could be that because of these smaller labels, a few larger companies began venturing deep into various parts of Africa – Western Africa, in particular – to record some of the most intense traditional music on the continent. In the early 1950s, the two labels that did the most of this were Fiesta and Philips. They seem to have made it to Niger, and even to Chad, though primarily they captured traditional and border music in northeast and northern Senegal, Mali, eastern Guinea, Burkina Faso, and northern Côte d’Ivoire. This disc is the only recorded example on 78 that I’ve come across featuring music of the Haalpulaar’en people of northern Senegal and southern Mauritania, surrounding the River Senegal. They are a subgroup of the Fulani, and speak the Pulaar language. 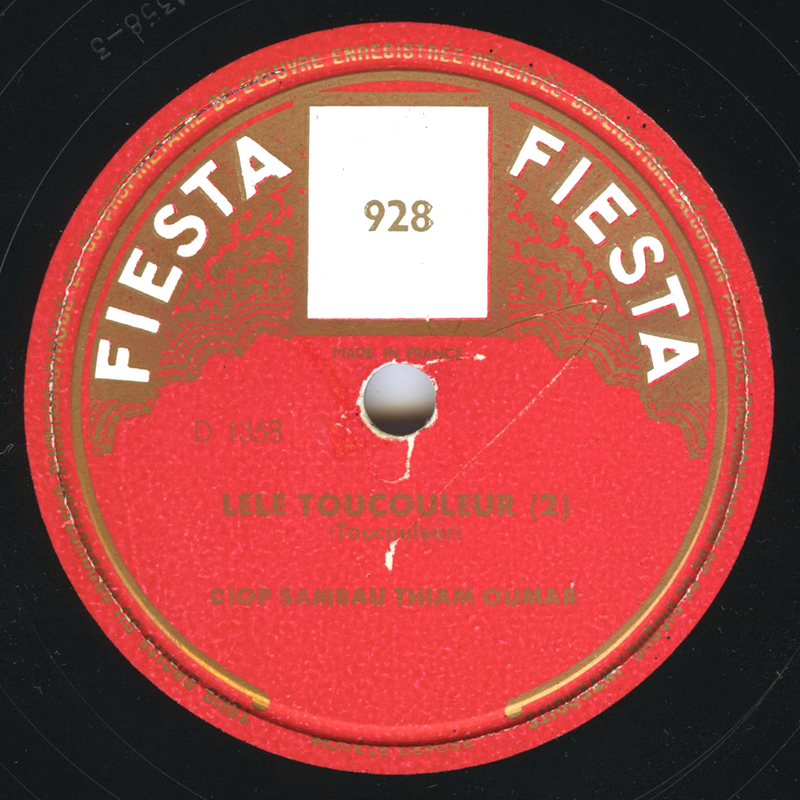 On the disc label there is a clue to their identity – the title listed on the label is “Lele Toucouleur.” “Toucouleur” is an archaic, variant name for the Haalpulaar’en. Thanks to a Haalpulaar friend in the comment section, we know that “Lele” is a type of Pulaar music. The singer accompanies himself on the hoddu, the local plucked lute of the Haalpulaar’en. There are many variations of this instrument all across West Africa – it’s frequently known as the xalam. The derivative in Mauritania is called the tidinit. Some claim it is the origin of the banjo. There are likely more early recordings featuring the Haalpulaar’en. Fiesta had its origins ca. 1950, and were a subsidiary of French Decca. They lasted well into the 45 era. This was a huge improvement on the weekend I had so far. My deepest thanks as always. Thank you, Sam – here’s to better weekends ahead. After listening to this track four or five times in quick succession, I’m not complaining. You made my day. Thank you for sharing this. I’m a Haalpulaar from Mauritania. This brings back great childhood memories. BTW, the title is “LELE Toucouleur”, not “LES”. Thank you for that, and for your comments! I’ll fix the title – very often the titles were poorly transliterated on the labels! Excellent, as always, and congratulations for the Grammy nomination !!! just came across your lovely site..top stuff m8.. Thank you for Opika Pende! and congratulation for the nomination of Opika Pende for a Grammy Award 2013 (Best Historical Album) !!! Really enjoyed this one. A great track and a great article as well. Fantastic, Bruce – and terrific music! I’ve been able to get ahold of a number of discs that are from Senegal/Guinea/Mali that feature xalam-like instruments and they are pretty sublime (I think)! Looking forward to more! I’m fascinated with all manner of West African lute-type instruments. There’s even a brief, great scene in the film Le Havre (which I recently saw), which features somebody playing one.Hopefully, I’ll be making some more trips over there as well! Thanks again for posting. Thanks for that one, hopefully we might enjoy the other side, too? while the instrument is a molo, a “monochord hoddu”, the liner notes confirm it as a love song.